Declutter your garage and stage it just like any other room in your home to make it more appealing to home buyers. I know that it’s tempting to stash all of your packing and storage boxes in the garage and hope that home buyers will understand, but this is a missed opportunity! Let them see how large your garage really is by emptying out all the overflow from the rest of the house. Give home buyers the opportunity to see a clean and organized space that will inspire them to want to do their own projects in your garage. Just remember that buyers usually think that a messy, cluttered home is most likely a dirty and neglected home. 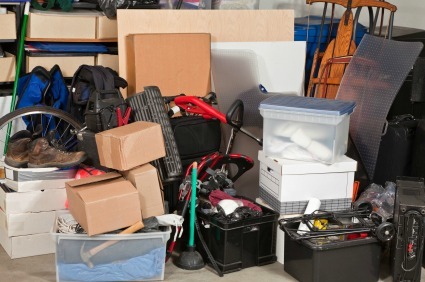 Don't scare homebuyers away with garage clutter like this! Arrange to store your belongings elsewhere. See declutter your home for storage ideas. 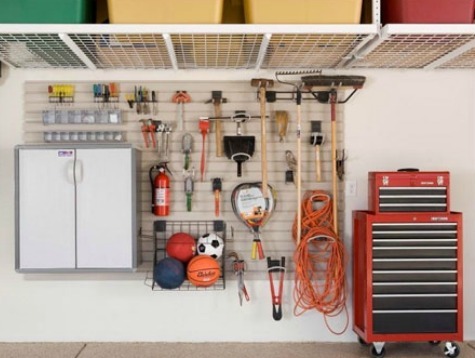 A garage crammed with stuff won't show well and home buyers will think that the garage is full because there isn’t enough storage in the house. Most Americans admit that their garage is the messiest room in the house and the dumping ground for anything that won’t fit inside their home. Work in manageable chunks of time; get help from friends who will keep you on task and prevent you from hanging onto stuff that needs to go! Declutter your garage by hauling everything outside. Use the driveway or yard for sorting items into groups. Place some items next to the road with a “Free” sign; if you’re lucky someone will think they’ve struck treasure and take them. Sort everything into separate boxes and bags labeled; donate, recycle, toss or pack for the new home. Avoid having a “deferred decision” box. Be ruthless about purging and made instant decisions. Stuff that's been “in limbo” for years in the garage are things that you obviously don’t need! 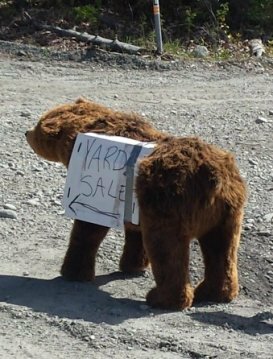 This cute yard sale sign is sure to to welcome visitors! Declutter your garage by having a yard sale. You may even have an impromptu garage sale take place as people drive by and see your stuff strewn across the driveway and yard! Don't stack up trash in the garage waiting for garbage day. Remove it daily-- keep it moving out of the house! Declutter your garage by moving sports equipment, tools, and yard equipment to an offsite storage unit. Hang on to only what you need to keep the house and garden looking great for home buyers. Arrange for delivery of a storage pod right to your doorstep, but check with city ordinances before doing so. Go to pods.com for more information. Make sure that your automatic garage door is functioning properly, especially the safety stop feature. If your garage isn't finished, consider completing this task. A finished garage never fails to impress home buyers. If you have a water heater, washer, and dryer, or any other kind of utilitarian equipment in your garage, wipe them down throughly to improve their appearance. If they look grimy and dusty, home buyers will think they are old and need replacing, and may try to negotiate the price of your home down because of it. For smelly oil spots on concrete floors, use a grease-cutting cleaner like “Goo Gone Grease Cutting All Purpose Cleaner” to clean them up. You can buy this product at amazon.com and most home improvement stores. Or sprinkle with kitty litter or sawdust on the grease spots-- let it set for 24 hours. Sweep up, then wash with a power washer and/or degreaser to remove any remaining residue. To properly clean, prepare and paint your concrete garage floor, see the instructional video below by ppgprofessional. 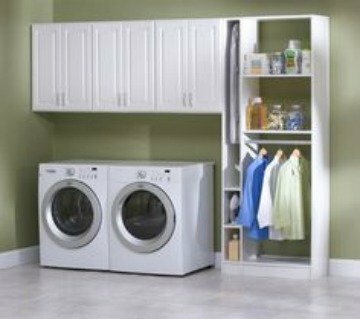 Designate a part of your garage for the washer, dryer, and laundry storage. Pinterest photo. If a washer and dryer are sharing the garage space, try to define that portion of the garage as a laundry room. As a former real estate agent, I showed numerous homes where I had trouble finding the washer and dryer in a garage, because it was hedged in by mountains of stuff! Don't force home buyers to weave their way through a tortuous path of teetering boxes. Stage the shared laundry area by putting up vertical storage like shelving or cabinets for storing laundry supplies. Install a hanging accordion style drying rack next to the washer and dryer. Go to Amazon.com for affordable hanging rack selections. Hang a few colorful blouses or shirts for staging--make the laundry area look cheerful and practical. When the garage is empty and all repairs have been done, consider painting the walls and ceiling white or another fresh and cheerful neutral color. If the garage has very dim lighting, install a few extra light fixtures to brighten it up. A well-lit garage will impress home buyers. If you want to really "wow" home buyers, paint the garage floor! There are many different products for painting garage floors, but a couple that really work well are epoxy floor paints from rustolem.com or armorcladepoxy.com. These flooring products come in a variety of colors and textures, but there is a downside. They aren't cheap. For more information on how to prepare and paint your garage floor, go to; familyhandyman.com. Leave the garage and driveway free of cars while your house is being viewed. 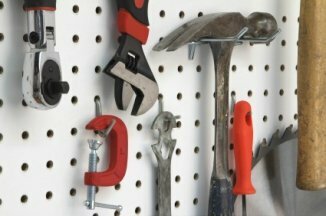 Hang a pegboard on the wall over a workbench, if you have one. Stage with tools or hang sports or gardening equipment. Home buyers will appreciate this organizing device. Install vertical storage shelves and store items in matching (or coordinating) bins and totes. Label the bins for easy access. Don't forget about the ceiling! 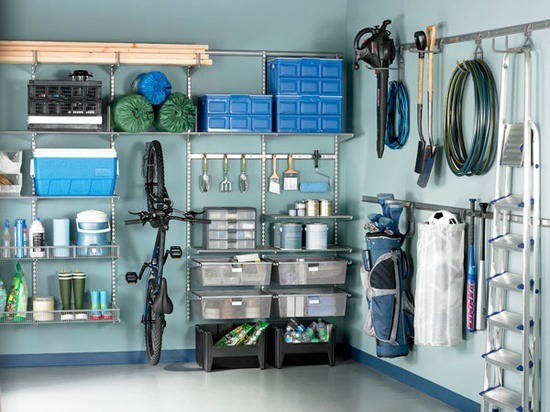 Get everything off the floor by installing overhead racks as a garage storage system.